The Northwest Coast includes a wide range of marine environments. The coast’s kelp beds help protect beaches from wave erosion and offer habitat for fish like the striped sea perch and mammals like the reintroduced sea otter. The rocky coastline provides tidepool habitat for a rich fauna of invertebrate sea creatures, among them urchins, stars, and cucumbers. The region’s tidewaters provide a vital migratory stop for shorebirds. Most the rivers in the ecoregion still support salmon runs. 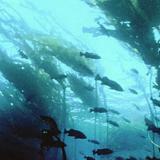 The National Marine Sanctuary website describes other marine habitats along our coast. Much of the coastal area is included in the Olympic Coast National Marine Sanctuary. Among those mammals most commonly associated with the ecoregion are Steller sea lions, Pacific harbor porpoises, and orcas. Birds include marbled murrelets, black oystercatchers, and tufted puffins.